There’s a new nest high above the shore of Lake Como, but it’s not for the bald eagles or other raptors sometimes seen there. Rather, the Como Lake Bed and Breakfast’s Aerie Suite is a cozy accommodation for human beings seeking a unique getaway right in the middle of the city. 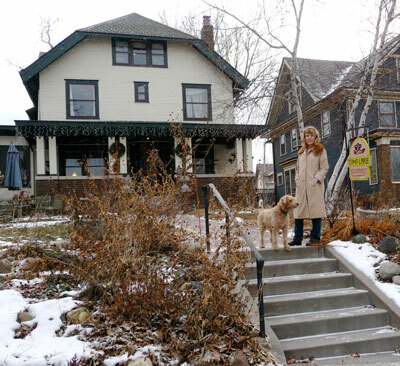 Carla Solberg Sherman opened her B&B in early 2011 and her guests rave about the antique charm of the century-old home at 1205 W. Como Blvd., its creature comforts and hearty breakfasts. “People really seem happy up here,” said Sherman, as she gave a tour of the nearly 800-square-foot, third-floor suite, which features a bedroom with a king-size bed, full bath with Jacuzzi, living room, kitchenette and library/office. Then there are all the attractions the Como area has to offer, including recreational opportunities, so Sherman has skates, skis and bicycles available for guest use. The home in which Sherman lives with her teenage son was built in 1915 by Elov Ericsson. He owned a creamery on the hill above Lexington Avenue at Jessamine Avenue that eventually was converted to condominiums. She and her then-husband bought the badly neglected house in the mid-1990s and a long process of restoration and renovation began. It’s not as though Sherman has a lot of time on her hands, because she’s also majoring in hospitality management and culinary arts at St. Paul College, working as an agent for Lynden Realty of St. Paul and helping coordinate the host program for international students attending the St. Paul Preparatory School. Business at the B&B has been slowly building, she says, although she’s starting to get repeat guests and the benefit of a great deal of word-of-mouth advertising. The Aerie Suite has been booked solid during graduation times at Macalester College and Hamline University, the car shows at the State Fairgrounds and during the Minnesota State Fair itself. For photos of the Aerie Suite and more information about the Lake Como Bed and & Breakfast, go to www.comolakebnb.com. Roger Bergerson lives in the Como Park neighborhood.